Queensland Telecommunications Museum - Telephone Exchanges. This is a 1940's vintage PABX manufactured by TEL England. An early Cord Type Magneto Switch Board. We have a very good collection of small working Telephone Exchanges on display. Some of these are shown in the above slideshow and detailed below. 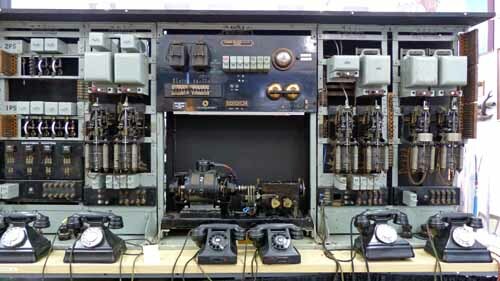 All of the pre-automatic exchanges required a telephonist to connect subscriber to subscriber or subscriber to Junction or Trunk circuits. 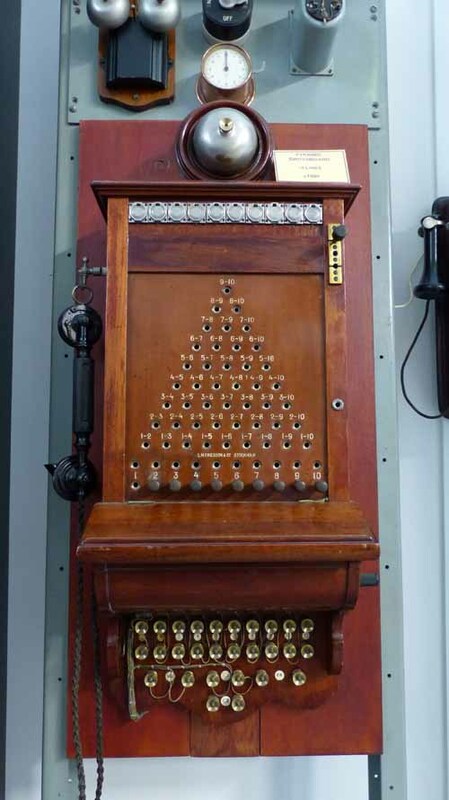 Strowger, a Kansas City Undertaker invented and patented an Automatic Telephone Exchange in the late 1890's. These patents were taken up by Siemens Brothers London who developed the Siemens 16 System that was installed in the Brisbane Network by the Postmaster-General's Department, starting in 1925. Trunk exchanges remained manual until the 1970's when the introduction of LM Ericssons' Crossbar System, Microwave Radio and Interstate Coaxial Cables allowed subscribers to dial their own Trunk Calls within Australia and overseas. All of these were analogue systems. Modern Exchanges are fully electronic operating digitally and interconnected by optic fibre cables. 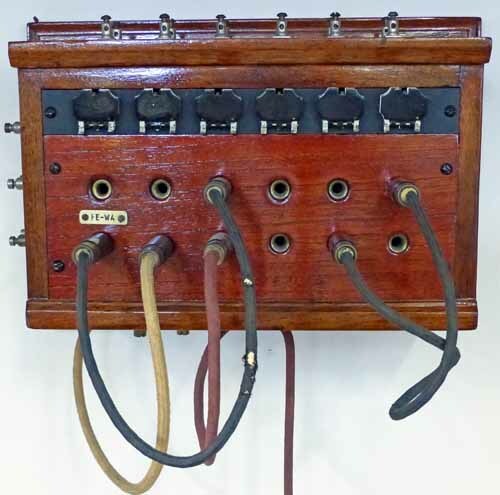 A very early magneto switchboard having one trunk or junction circuit and a maximum of five subscribers. Line connections were made on the top. Cross-connections were made with 2 wire double ended cords. 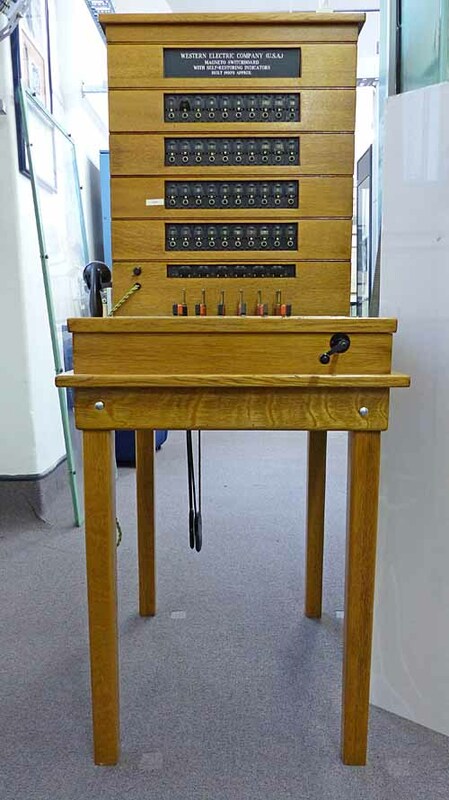 This is a working model automatic exchange based on the Siemens 16 system, developed by Siemens Brothers, London in the early 20th Century. Brisbane was the only city in Australia to use this system in its network in the 1920's and 1930's. 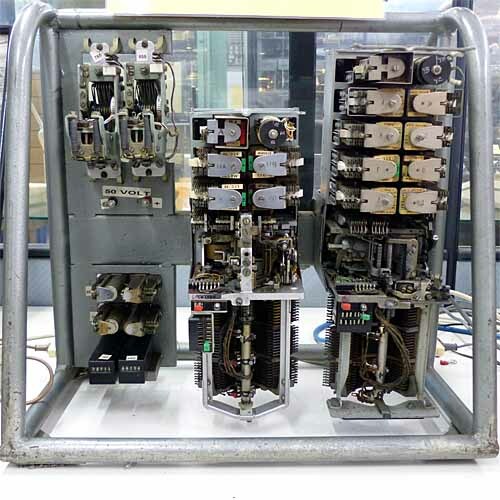 This model was supplied by Siemens to assist in the training of mechanical/technicians in the new-fangled automatic systems. This is a 1940's vintage PABX manufactured by TEL England. Catering for up to 40 extensions, it used line finders and bi-motional selectors. An operator was necessary to "field" incoming calls. An early cord type magneto switch board catering for up to 30 subscribers and 8 junctions or trunks. 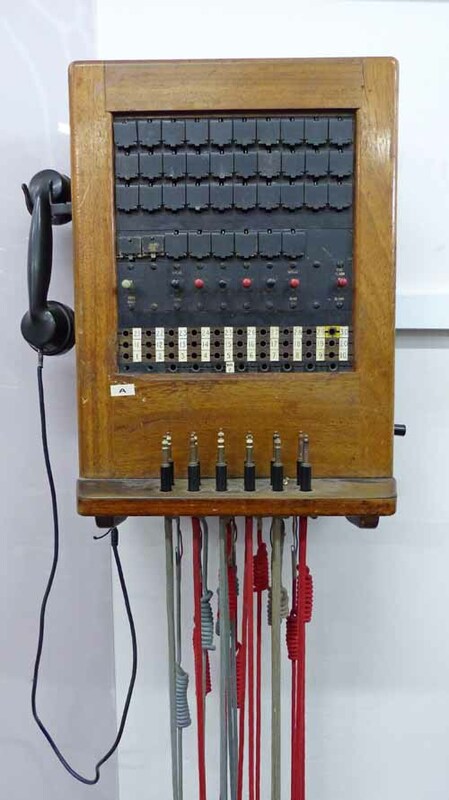 The cord circuits included supervisory functions which greatly improved the efficiency of the operator/telephonist. 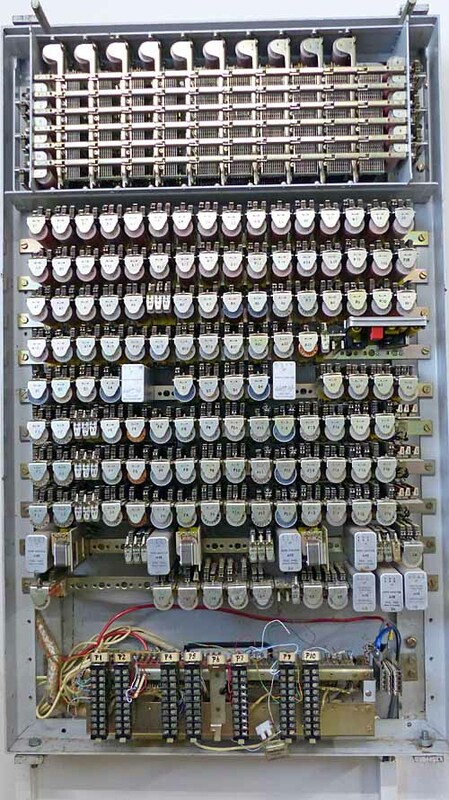 A very eary "Pyramid" magneto switchboard, with one trunk or junction connection and up to 10 subscribers. Used extensively in country areas until the 1970's. There were no cords, connections being made by inserting a plug in the appropriate jack. E.G. 3 - 4 connected subs 3 & 4. Manufacturer L.M. Ericsson, Sweden Late 19th Century. 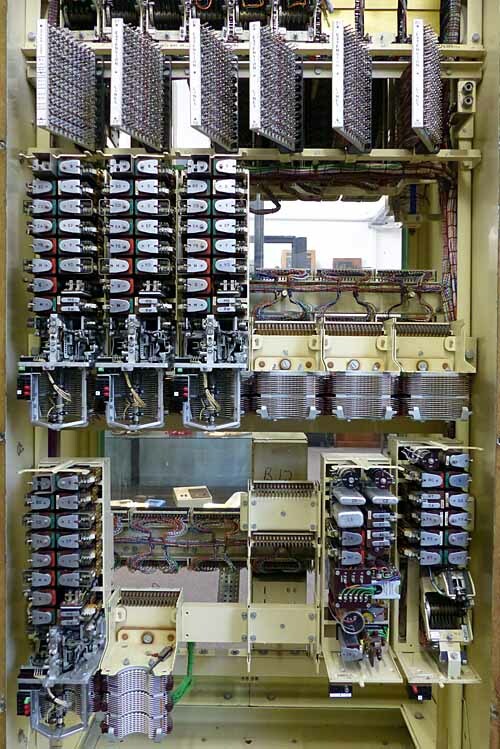 The Western Electric Magneto Exchange section switchboard may start with the smallest of equipment - a single sectional unit - and may be added to vertically to cater for additional subscribers as needed. The top rests on the upper line equipment unit and when it becomes necessary to add one or more lne equipment units as the switchboard grows, this top is merely taken off, the other line-equipment units put in place on top of these already existing and the top replaced. Each section added came complete with a rear door to facilitate inspection of the apparatus and wiring. This is a tiny model of the "2000 type" automatic exchange. This 2000 type equipment was installed throughout Australia and in Brisbane supplemented the Siemens 16 equipment as the network grew until both were replaced by Ericsson Crossbar Exchanges. A 1960's vintage L.M. Ericsson ARD521 Crossbar PABX. This catered for up to 10 extensions. This unit provides communications throughout our museum. The crossbar switch replaced the earlier bi-motional selectors and drastically reduced maintenance costs.